DomainInvesting.com just received its 50,000th comment since the blog was started in 2007, and I want to take a moment to say thank you for sharing your thoughts and your time with all of us. Comment # 50,000 came this morning from Anjan Bhushan on an article about the Heritage Auctions domain auction. With 4,007 articles posted on the website since it began, that means there is an average of between 12 – 13 comments per post. We may not always agree on various topics, but I appreciate the fact that you are willing to take the time to post a comment. I think the comment section is what find most interesting about blogging, and I have learned quite a bit from what you’ve shared with me. Thank you for finding the time to comment. That’s great achievement! 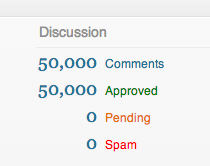 Congrats on reaching 50,000 comments on this blog. Your Blog and Mikes @ TheDomains.com both receive excellent comments and it is great to often read the debates between commenters also. WTG Elliot! I rarely post on blogs but I do post here! Congrats on that awesome milestone Elliot!! Testament to the invaluable content you have published and continue publish. Although, to say DomainInvesting hit 50,000 comments is a bit mischievous given the blog has only recently become DomainInvesting. C’mon, I’m an analyst by trade. Data pedantry is my bread and butter! Congrats Sir Elliot and thanks to ME. Congrats! That is a huge milestone! No spams? What plugins are you using?